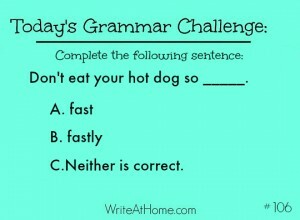 I post a daily Grammar Challenge on my Facebook page. It’s fun and gets lots of comments. The nice folks that post their answers are more grammatically astute than most people and it’s tough to stump them. Sometimes, however, I am surprised to find that a question I think will be easy turns out to be a real poser. I predict that if I asked the broader populace about this, the great majority would have chosen the right answer — fast — without a moment’s hesitation. It’s only the grammar-conscious minority that struggle with it. Don’t eat your hot dog so greedy. Don’t eat your hot dog so sloppy. Don’t eat your hot dog so sad. Don’t eat your hot dog so greedily. Don’t eat your hot dog so sloppily. Don’t eat your hot dog so sadly. It just sounds right when obvious adverbs end in ly. When they don’t, we get nervous about our grammatical correctness. Most common adjectives have adverb forms that end in ly. But not all of them. There are a handful of often-used adjectives with identical adverb forms. Fast is among them. Others include soon, hard, tough, and far. Fastly simply doesn’t exist in the English lexicon. There’s no explanation for this. Fast is just an exception. And this isn’t some recent-and-therefore-suspicious evolution in language. 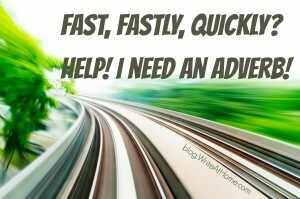 It has always been okay to use fast as an adverb. In fact, according to the Oxford English Dictionary the use of fast (meaning “with speed”) as an adverb predates its use as an adjective. The first recorded adverbial use of fast goes back to 1275 and there are examples in published works in every century since. Quickly is a fine word. It is synonymous with fast in most current uses. But it is not the adverb form of fast. Fast is the adverb form of fast. You may choose to use quickly if you like, but don’t choose it because you think it is somehow more “correct” than fast. So, go ahead do things fast if you like. If anyone questions the grammatical soundness of such a usage — send them to this blog post! Get your comments down there in the reply section fast! Thank goodness you wrote this!! I am someone who is hyper-aware of grammar and the words I hear and how people use them. I often refer to myself as the polite grammar-police. However, this is an instance in which my fervor nearly backfired. (My love for language led me to arrogantly assume that quickly is more correct than fast.) I have not yet actually corrected anyone for having made this ‘mistake’, but recently have been silently criticizing television personalities for committing it. Glad to know I can ease up on the public a bit, and that for once, I WAS WRONG! I confess. I got it wrong. After looking at the answer I thought, “I would have said it using ‘fast’.” I think the grammar quiz question itself might prompt grammar-consciousness in the test-taker. It would be interesting to compare responses to a context-suggestive fill-in-the-blank version of the question with those to the multiple choice version.